What Ho, and Happy P.G. Wodehouse Day everyone! That’s what I’m calling Valentine’s Day this year. And why not? It’s a good day for it. Saint Valentine can’t expect all the attention for himself. Nor can he bally well object — as the Patron Saint of affianced couples, love, and marriage — to us celebrating an author who wrote about these things in abundance. St Valentine’s Day is also the anniversary of P.G. Wodehouse’s death in 1975. And if your romantic life on Valentine’s Day is as depressing as mine, Wodehouse is the man to turn to for solace and cheer. This February, I’ve been on a mission to discover your favourite romances from Wodehouse’s world. If you’ll indulge me today (and I really feel somebody ought to), I’d like to share a few of my own favourites. Something Fresh was the book that marked my conversion from a Wodehouse reader to budding completist and fanatic. One of the many memorable features of this novel is the romance between the central characters. They are, like most of Wodehouse’s great couples, genuine equals. At the beginning of the story, they’re both earning a meagre income as writers for the same magazine. Joan is an intelligent and capable heroine, brimming with gumption. She motivates Ashe to leave his dingy apartment in search of adventure at Blandings Castle. “How perfectly splendid! I was terrified lest I might have made you change your mind. P.G. Wodehouse’s Psmith. Cover of the Bietti edition of Leave it to Psmith (1936). Flamboyant, marvellous, ingenious Psmith is the shimmering star of Wodehouse’s early work and a favourite character of many Wodehouse fans, including me. In Leave it to Psmith, he meets his romantic match in Eve Halliday. Eve is a strong capable heroine with limited means, while Psmith has been reluctantly employed in the fish business. After a chance encounter, Psmith and Eve meet again at Blandings Castle. Eve is a star character in her own right, shining though the story in a way that Psmith’s boyhood companion Mike Jackson (much as we’re fond of him) never managed to do. Had Wodehouse matched Psmith with anyone less worthy, we could not have forgiven him. People with a mere nodding acquaintance of Wodehouse are often surprised to learn that he created many central characters like Joan, Eve, Ashe and Psmith (especially in the stand-alone novels) who were obliged to work without the support of a large income. P.G. Wodehouse is much better known as the creator of Bertie Wooster and his fellow Drones — idle young men of independent wealth and sub-par intelligence. And they don’t get much idler or sub-parer than Archibald Mulliner, a genial fellow whose only claim to fame is his ability to imitate a hen laying an egg. – a ‘Charawk-chawk-chawk-chawk’ of such a calibre that few had ever been able to listen to it dry-eyed. Following which, it was Archibald’s custom to run round the room, flapping the sides of his coat, and albumen which she sees lying beside her in the straw. And at that, all doubting resolved, the crooning changes; takes on a firmer note; soars into the upper register; and finally swells into a maternal pæan of joy – a ‘Charawk-chawk-chawk-chawk’ of such a calibre that few had ever been able to listen to it dry-eyed. Following which, it was Archibald’s custom to run round the room, flapping the sides of his coat, and then, leaping onto a sofa or some convenient chair, to stand there with his arms at right angles, crowing himself purple in the face. But even a hen-laying-egg impersonator can find love in Wodehouse’s generous world, although Archibald needs to apply the full extent of his talents to smooth the course of a difficult wooing. Some of the great Wodehouse romances take their time to develop. For others, love blossoms from the very beginning. The two twin souls gazed into each other’s eyes. There is no surer foundation for a beautiful friendship than a mutual taste in literature. ‘My name is Amelia Bassett,’ said the girl. ‘Perhaps you have heard of my mother. Lady Bassett. She’s rather a well-known big-game hunter and explorer. She tramps through jungles and things. She’s gone out to the lobby for a smoke. This quotation ends with a hint of the difficulties to come, in the shape of Lady Bassett and her explorer chum Lester Maple Durham (pronounced Mum). These fierce obstacles to a happy union are not easily overcome – it will require all of Cyril’s courage, a goodish brace of cocktails, and a copy of Horatio Slingsby’s ‘Strychnine in the Soup’ to win the girl he loves. In Very Good, Jeeves, Bertie Wooster is reluctantly obliged – under instruction from his Aunt Agatha – to break up his Uncle George’s romance with Rhoda Platt, a young waitress. With Jeeves’ assistance Bertie is successful in breaking off the romance, causing the occasional misguided critic to point to this story as evidence of misogyny on the part of the author and his characters. This view is drivel! “Indian Summer of an Uncle” is a rare but triumphant example of a mature couple finding romance in fiction. Rhoda Platt’s Aunt, Maudie Wilberforce, is revealed as the former Criterion bar-maid to whom Uncle George (now Lord Yaxley) was one engaged. If the family considered her an unsuitable match then, she is even less appealing in advanced middle age. I should think that in her day she must have been a very handsome girl, though even then on the substantial side. By the time she came into my life, she had taken on a good deal of excess weight. She looked like a photograph of an opera singer of the ’eighties. Also the orange hair and the magenta dress. But some extra girth and a dash or orange hair are no obstacle to love in Wodehouse’s world. Uncle George has no hesitation in choosing his former love over her pretty young niece. The first thing she did when she came in was to start talking about the lining of her stomach. You see the hideous significance of that, Jeeves? The lining of his stomach is Uncle George’s favourite topic of conversation. It means that he and she are kindred souls. The reunion of Maudie Wilberforce and ‘Piggy’ Wooster is a touching scene, in which the lining of stomachs features heavily. And it gives an aged and girthed f. of the s. like myself some small hope for the future. But that’s enough sentiment from me today. I’m off to read Honeysuckle Cottage. Obviously Cynthia was perspicacious (and as a Cindy, whose 92 year old mother still calls me Cynthia, I respect this). Both Agatha, and Ms. Christie, would surely approve. Thanks so much, Cindy. Happy Wodehouse Day! What Ho, Cindy! Or indeed, Cynthia. I do hope Mulliner Nights is living up to expectations. A perfect celebration 🙂 Happy PG Wodehouse Day Honoria! I’m chuffed. Happy Wodehouse Day to you too! A delectable offering on the special occasion! Wishing you the very best in all your endeavours!! 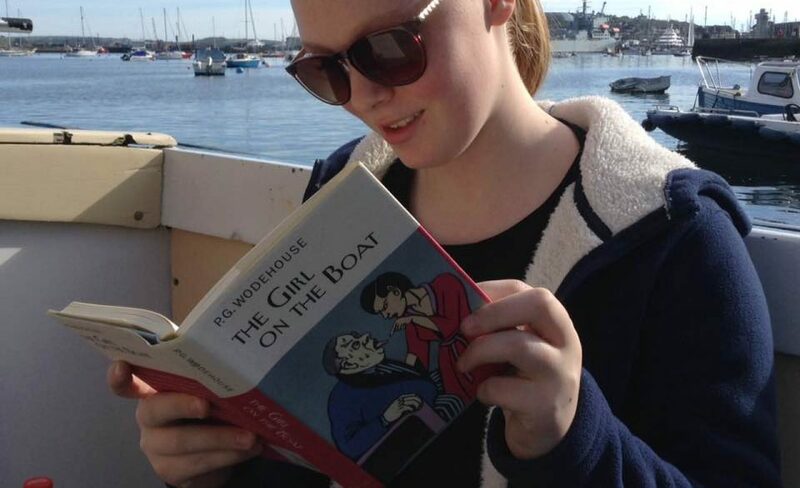 Happy P. G. Wodehouse day to you Honoria, I think it’s a great idea. I’m happy to see from your references above that there are some Wodehouse romances I’ve missed and still get to read, yay! Oooh! Happy reading Maria. You have some treats in store. Coincidentally, I am at present reading Leave It To Psmith in twice-daily installments, to make sure I brush my teeth for the length of time calculated to make a dentist look at his bank account in despair. I am becoming increasingly adept in the art of laughing through a toothbrush without injuring myself (though reading out the best bits to my husband is still proving difficult). I’d love to see that. It sounds both fun and challenging.